A composite material is formed when materials with different characteristics are combined and used as a single material. The use as fiber-reinforced composite materials made from carbon fibers or SiC (silicon carbide) fibers makes it possible to create structures which are lighter and possess higher levels of strength than conventional metal materials. These composite materials will contribute to improving the performance of aircraft and spacecraft components. In order to respond to increasingly strict requirements for low-weight aircraft, environmental standards and aircraft safety, composite materials will be used at an increasing rate. In this way, composite materials have the potential to significantly contribute to our daily lives in the future. However, when compared to capability of metal materials accumulated over a period of many years for the design, manufacturing, maintenance and recycling, there are obstacles to the spread of composite materials which are still relatively new. It is necessary to clarify these obstacles, to improve composite materials, and to research related design technology. Through gaining experience, we have to accumulate and release composite material technology. Furthermore, it is also necessary to focus on materials technology in 20 years and to conduct unremitting research for the creation of next-generation composite materials. JAXA seeks to contribute to the Japanese aerospace industry by conducting research with the aim of overcoming weaknesses of current composite materials, clarifying unknown aspects such as fracture mechanisms, improving performance and enabling application to design technology. We are also conducting research on analysis technology required for aircraft design technology and performing demonstrations of composite materials and structures. To perform such research JAXA uses strength evaluation equipment, physical-property analysis devices and non-destructive inspection devices which have been designed and customized for research and development of composite materials. JAXA is the only organization in Japan to possess such specialized equipment. We are aiming at improving lightweight, highly heat-resistant, and high-strength polyimide/carbon fiber composite materials to a practical level and promoting the spread of these composite materials. To achieve this goal, we are developing curing process technology that enables a cost reduction of approximately 20% compared to conventional processes for proposal to projects and manufacturers. We seek to establish base technology that can be applied to various fields. Currently, nickel-based heat-resistant alloy is used as the structural material for the low-pressure turbines of aircraft engines. We are conducting research and development to replace this conventional alloy with CMC (ceramic matrix composites). Furthermore, in preparation for application to high-pressure turbines and combustors which are exposed to the most severe conditions, we are working to develop heat-resistant composite materials with oxidation-resistant properties for long-term exposure to high temperatures around 1,400ºC. We are developing numerical analysis technology for predicting damage incurred by stitched CFRP which possesses highly-flexible properties for resistance to high-velocity impact. We are enabling the use of this technology as a design tool. We are advancing research related to the synthesis of multifunctional composite materials applicable to various fields, not only by combining pure carbon nanotubes (CNT) and graphene into a composite material, but by hybridizing them with other metallic substances to enhance reinforcement properties or to provide novel properties. We are establishing non-destructive inspection techniques and impact resistance evaluation technology for improving the safety of airframe structures. Furthermore, by realizing such technology, we aim to create new airframe structure concepts which are more efficient and provide a higher level of safety, and to bring innovation to airframe maintenance programs. We are devising new joint forms, selecting the optimal combination of materials for these new forms, and exploring joints which provide high levels of strength and reliability. We are also pursuing joints which provided balanced solutions to issues such as manufacturability, ease of assembly, ease of repair, and cost. We are challenging to perform a detailed assessment of the behavior of thermoplastic composite materials during curing. We seek to clarify the correlation between the curing process (pressure, temperature) and curing quality (crystallinity degree, residual strain, internal fiber distortion, sheet thickness, etc.). Through fundamental surveys and investigations related to CFRP recycling technology, we are conducting research on the synthesis of composite materials that are re-applicable to CFRP components from high-performance carbon fiber used for aircraft structures. As new curing methods for CFRP, we have been conducting research and evaluation for the VaRTM molding method and VPH molding method which enable manufacturing at a lower cost than the traditional autoclave curing method. We are advancing the standardization (JIS, ISO) of evaluation methods so that the accumulated results of composite materials evaluation methods can be used by industry. We are disclosing our achievements related to composite materials technology research as an advanced composite material mechanical property database (JAXA-ACDB) for assisting the Japanese aerospace industry in its enhancement of global competitiveness. 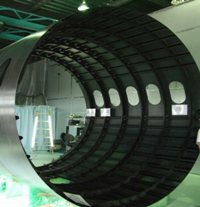 By evaluating corrosion resistance through a combination of various lightweight alloys and CFRP (carbon fiber reinforced plastics), we are aiming to ensure the reliability of aircraft which use large amounts of structural materials manufactured from CFRP, and to formulate guidelines for design and maintenance. We are conducting research regarding the use of CFRP in liquid hydrogen tanks and other cryogenic liquid propulsion tanks which are required by next-generation rockets, reusable launch vehicle systems, and hydrogen-powered aircraft. By assessing aerodynamics, structures and other nonlinear characteristics of aeroelasticity, we are designing an active aeroelasticity control system by constructing a more faithful controlled object model while working to improve the accuracy of numerical analysis technology. We are developing remote strain measurement technology which will reduce measurement cost, improve development efficiency, and improve airline’s operational efficiency in maintaining aircraft. We are constructing a system identification theory for use as the time-variant system and non-linear system of flexible structure systems. Also, we are developing a method which identifies as the time-variant system the on-orbit dynamics of large flexible satellites which possess large deployable structures or mobile deployable structures. We are aiming to establish technology for evaluating the characteristics of on-orbit flexible structures, and to apply the technology to the development of next-generation large flexible satellites. We are aiming to establish functionalized structural technology which combines sensing technology, load control technology (including actuation), variable structure design technology, and aero elasticity control technology. Making integral use of these technologies will enable us to design higher aspect ratio wing and also to develop “functionalization” capable of morphing structure optimal to surrounding environment and weather conditions. FLIGHT PATH No.9/10 "What are ceramic matrix composites (CMCs)?" FLIGHT PATH No.9/10 "Optical Fiber Sensor Research"
Sora to Sora No.50 "Developing an easy-to-use strain measurement system"
Sora to Sora No.33 "Fabricating aircraft at lower cost"
JAXA Aeronautics Magazine "FLIGHT PATH"